By design, data binding errors do not cause exceptions. This behavior is desirable because the source of a data binding may enter a valid and invalid state a lot during the life of your application. Let’s take the example we saw earlier where we have a list of controls bound to the SelectedItem of a ListBox. When there is no selection in the ListBox the data binding is failing. Throwing an exception in that case would be the wrong thing to do. So, as a developer, you will need a way to actually see data binding failures. 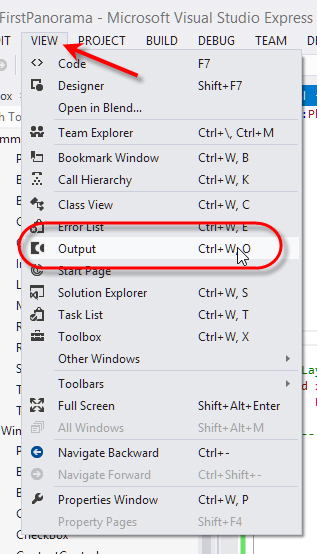 Luckily you can see them pretty clearly in the Visual Studio Output window. When running your application, you can use the View menu to show the Output window, as shown in Figure 3. When data binding fails, it adds a debug message to the Output window. For example, if you used the wrong path in a Binding (e.g., Title instead of Name) you could see this in the Output window, as shown in Figure 4. Bad paths aren’t the only binding errors that show up in the Output window; bad conversions (really, any exceptions) do as well. For example, if a user attempted to enter a bad date (e.g., 2/31/2010) into a date field, the Output window would show that error, too, during data binding (as seen in Figure 5).